If you haven’t heard of it before, Quorn is a delicious meat-alternative which is made from protein rich 'Mycoprotein'. Mycoprotein is a type of fungus, grown from fermentation. Mycoprotein has been around since the 1960's and is gaining popularity more recently. Lots of people are changing their diets, whether going vegetarian, vegan or flexitarian! And for all the reasons to make a change, protecting the health of our planet is perhaps one of the biggest reasons. Carbon footprint, Greenhouse Gases and emissions are all words we’ve heard before, but may not know much about them. What if I told you there was a simple way to help us manage all of these things? Now turn your attention to the kitchen. Eating a little less meat each week can have a huge impact on the environment. Yes, it’s that simple! Did you know that in one year, you can save more water by not eating 4 quarter pounders than by not showering? Well, not showering is pretty unhygienic, so how about trying a healthy meat-alternative like a Quorn burger instead? Switching meat for a meat-alternative has lots of benefits for both our health and the environment, and Quorn has lots of tasty products. Quorn Mince (vegetarian product), for example, has 90% lower Greenhouse Gas emissions than beef mince! So we can still enjoy our favourite meals without harming the environment. Quorn has two ranges: vegetarian and vegan. In the vegan range there is: ‘ Quorn Vegan Schnitzels, Quorn Vegan Nuggets, Quorn Vegan Hot and Spicy Burgers, Vegan Fish Free Fingers, Quorn Garlic and Herb Fillets and Quorn Vegan Fillets (that’s in Australia anyway). In Australia they can be found in major supermarkets such as Coles and Woolworths. It’s a UK based company so can also be found in the UK, Europe and USA. While they may not be a whole food plant-based protein, they definitely play a healthy part in a vegan and vegetarian diet. Particularly when transitioning to a fully whole food diet but not ready to go full broccoli ;) They’re also a handy option for meat free families wanting a quick and simple meal option for fussy eaters on special occasions (such as kids’ birthdays!). Annnnd they taste a lot like the meat that they are alternatives for! I haven’t eaten schnitzels, nuggets and fish fingers in a long time, but the texture is pretty on point! (stringy and with a bite, just like chicken). If you’d like to try Quorn for yourself, I have created two delicious recipes below using the Vegan Fish Free Fingers and Quorn Vegan Schnitzels. I’d love to know what you guys think. 1/4 cup water, or enough to reach desired consistency. Toss the potato wedges in the 1 tbsp of olive oil dried thyme/rosemary, and salt. Place potatoes on a baking tray, ensuring they are not touching each other. Place in the oven to bake for 30-40 minutes or until golden and crispy. Place the Fish Free Fingers on a tray and sprinkle with parsley. Place in the oven to cook as per packet instructions. Make the side salad by tossing all ingredients in a salad bowl, set aside in the fridge or serve on the plates. Make the vegan tartare sauce by blending all the ingredients in a blender until smooth and creamy. Pour into a serving dish. Remove the potatoes and Fish Free fingers from the oven and place on the plates or in a big share bowl. Serve with salad and vegan tartare sauce. Pre-heat the oven to 170 degrees celcius fan forced. Place the Quorn Vegan Schnitzels on the baking tray, and place in the oven to cook as per packet instructions. Add all of the bacon ingredients to a bowl and mix well. Place onto a baking tray, spread them out evenly and place in oven to bake for 15-20 minutes, or until crispy and shrivelled up. Next make your caesar dressing. Add all of the ingredients to a blender and blend on high for 3 minutes, or until silky smooth. Pour dressing into a container/bowl and place in the fridge to cool while you prepare the salad. You can also pre-make a bigger batch of this if you would like to prep a few extra servings of this salad throughout the week. To make the salad, prep the veggies as per the ingredients list. Add the salad ingredients to a large salad bowl, spoon over half of the dressing and toss all ingredients together. Keep the other half of the dressing in a small bowl for serving. Place the cut up bread onto a small baking tray, drizzle the olive oil over the bread and sprinkle the crushed garlic over. Toss together and then place in the oven to bake for approximately 10 minutes or until crunchy (like a crouton). Remove from the oven and set aside. Remove the Vegan Schnitzels from the oven and slice into 1cm strips. 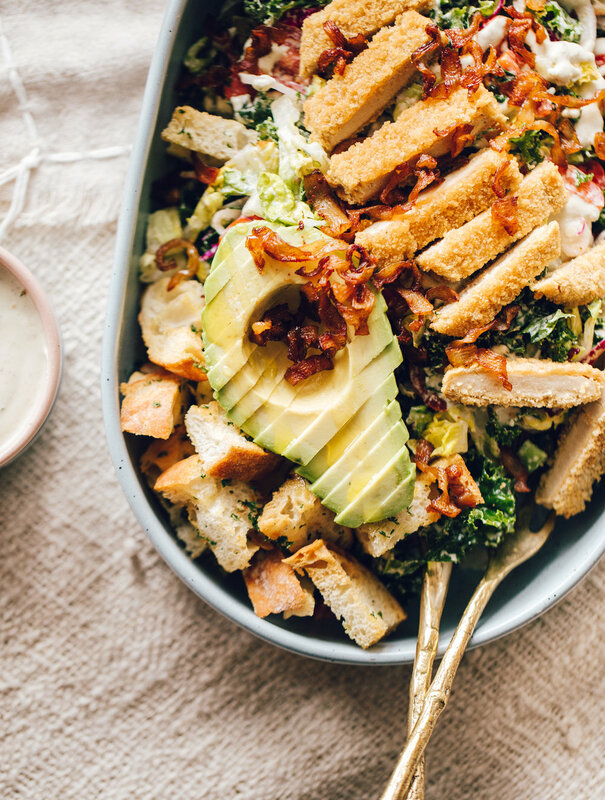 Place the schnitzel strips, croutons and sliced avocado over the salad. Sprinkle the vegan bacon over and toss everything together. If you give these recipes a try, drop a comment and let me know what you think! !